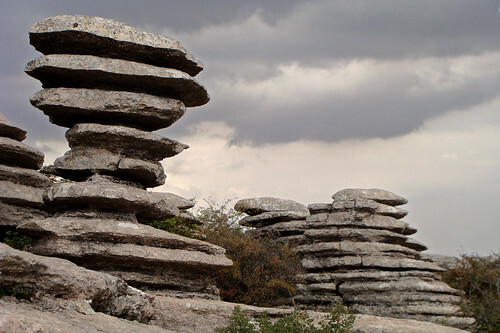 El Tornillo Del Torcal (meaning The Torcal Screw) is an stunning and amazingly balanced stack of rocks formation in the alien looking landscape of El Torcal Nature Reserve, situated in the Sierra del Torcal mountain range south of Antequera, Spain. The karst landscape of the area is a geologist's paradise and is full of impressive rock formations and the Torcal Screw is one of the most prominent and famous rock of this area. It perhaps derives its name from Archimedes' Screw.